Historically, role players have contributed to the University of North Dakota’s success. Recently, that role player is backup goalie Matt Hrynkiw. 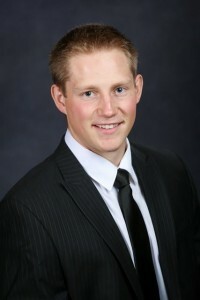 Hrynkiw arrived at UND at the beginning of the 2013-14 season, and during his first two seasons he played less than 10 minutes in a couple of exhibition games. While some players would’ve quit or moved on, not playing didn’t phase Hrynkiw. He kept working hard in practice and waited for an opportunity to take the net. Finally, on October 16, 2015, Hrynkiw’s number was called. 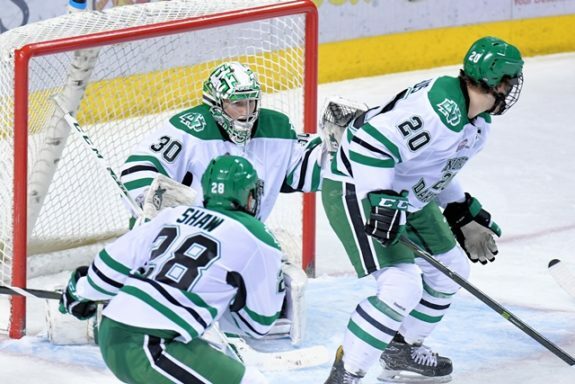 He was the next man up after UND’s starting goalie Cam Johnson suffered a lower-body injury. For the first time in his collegiate career, Hrynkiw stepped on the ice against the Bemidji State University Beavers. This time, it wasn’t for a few minutes at the end of an exhibition game. Finally, he was the man. UND was the visiting team in a hostile arena and they were leading 4-2. The Beavers were pressing, but Hrynkiw stood his ground. Hrynkiw stopped 10-of-12 shots, securing a much-needed tie for UND. Johnson returned to the lineup in November 2015, and Hrynkiw returned to the backup role. Then on March 5, 2016, in a game against the Western Michigan Broncos, Hrynkiw entered the game in relief after Johnson had given up three goals on four shots. Hrynkiw performed remarkably, stopping 16-of-17 shots winning his 10th game of the season. During the 2015-16 season, Hrynkiw played in 14 games. When the season was over, he had respectable numbers with a 10-2-2 record, a .2.13 GAA and a .910 save percentage. After the win against the Broncos, I asked him if he had ever thought the season would play out like this? Hrynkiw returned to the Fighting Hawks for his senior season and competed for the backup position with sophomore goalie Matej Tomek. Through his hard work and perseverance, he solidified himself as the Fighting Hawks number two goalie. After watching Johnson start 55 consecutive games, Hrynkiw’s number was finally called again when Johnson suffered an undisclosed injury. He played three games with a 1-2-0 record. In four games this season, Hrynkiw has respectable numbers: a 1-3-0 record, a 1.93 GAA and .915 save percentage. It’s not a given that Hrynkiw will play again this season, but he will be ready if his number is called. His career numbers are respectable: 11-5-2, 2.09 GAA, .911 save percentage. After four years of playing in a backup role, Hrnkiw wouldn’t have it any other way. There are no regrets. Hrnkiw has done a good job balancing his school work and hockey. That’s not an easy task. He isn’t taking easy classes, he’s a Mechanical Engineering student. He’s also been named to the All-Academic team in all four seasons he’s been at UND. “It’s challenging,” Hrynkiw said. “In our major, a lot of people are very focused on academics. Some of the professors aren’t really aware of the athletic side of things. It’s been a bit of a balancing act. You have to be upfront with people. I am seriously vested in doing both. I am not willing to give up either. I am not looking for shortcuts. I am going to do all of the work. With a tough major, it’s tough to have a social life.